I am not a “zen” person. My idea of a stress reliever is a bottle of wine all to my self. But I come to ‘Tween Waters Inn to relax. I unplug from my phone, my computer, my email, and I sit on the beach and soak in the sun. Despite my tendency to remain as immobile as possible on vacation, my favorite relaxation activity is yoga on the beach. There’s something about the sound of the shells tinkling against the surf as they’re pulled back into the sea that intensifies my calming breath and detoxifies my body. Classes are every Wednesday and Saturday, at 8AM and cost $15 per session. Due to the outdoor location, class will be canceled if the temperature is below 55 degrees or in the event of thunder, lightning or rain. Young and old, experienced and novice, bendy and stiff, Yali accepts all students willing to try. I took a yoga class in college, so I like to pretend I know a little something about striking a sun salutation, but in reality I’m about as novice as they come. Still, I felt comfortable amongst the newbies and pros that joined me one Saturday morning at ‘Tween Waters Inn. We began with a little meditation and breathing exercises, followed by some stretching and hatha-vinyasa-style yoga. Mid downward dog, I peeked to my left and witnessed an elderly gentleman try to stretch his booty in the air and I gave a little giggle. I imagine the person to my right was laughing at me too. 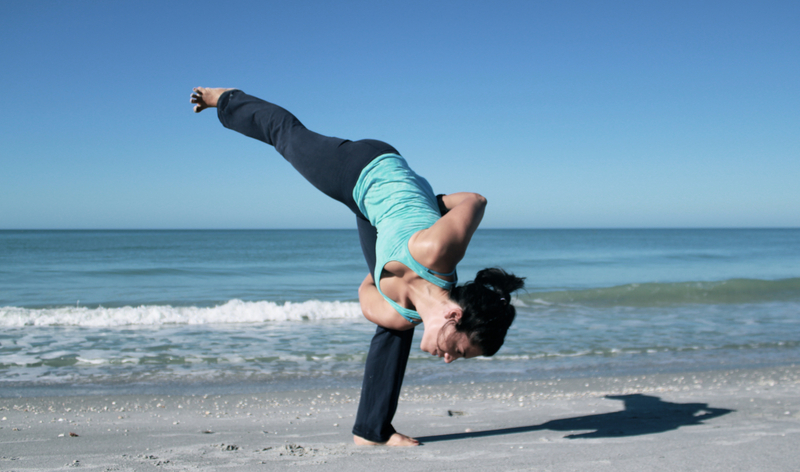 For more information about Yoga on the Beach at ‘Tween Waters Inn, visit AmbuYoga.com.